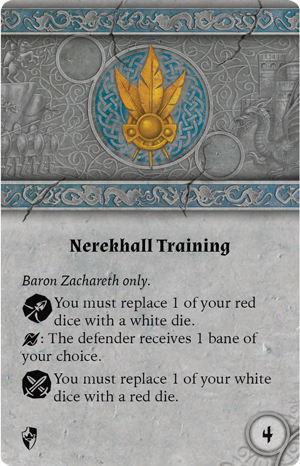 Order your own copy of the Baron Zachareth Hero Expansion at your local retailer or online through our website today! Baron Zachareth is a complicated figure in the Land of Steel. While he is beloved by his subjects in Carthridge, others across Terrinoth have been wary of the lord ever since he first assumed power under dubious circumstances. Now, he occupies an uneasy seat of power among the Daqan Lords—his comrades struggle to maintain peace as the rash baron demands action. Baron Zachareth maintains that a full attack from the thirteenth barony is imminent and the only way to defend Terrinoth is to strike first. As the leader of Carthridge, which borders the Mistlands, he volunteers to lead this campaign himself. 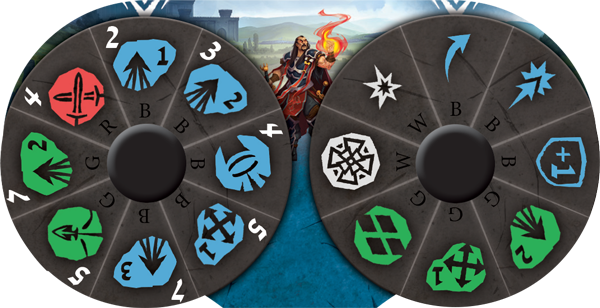 Zachareth's martial training is reflected on his command tool, which offers the baron a full range of blue movement action at initiatives between two and seven. You can use the warrior to charge as early as initiative two if your enemy wanders too close, letting you get the drop on your opponent and strike before the enemy unit can launch a counterattack. 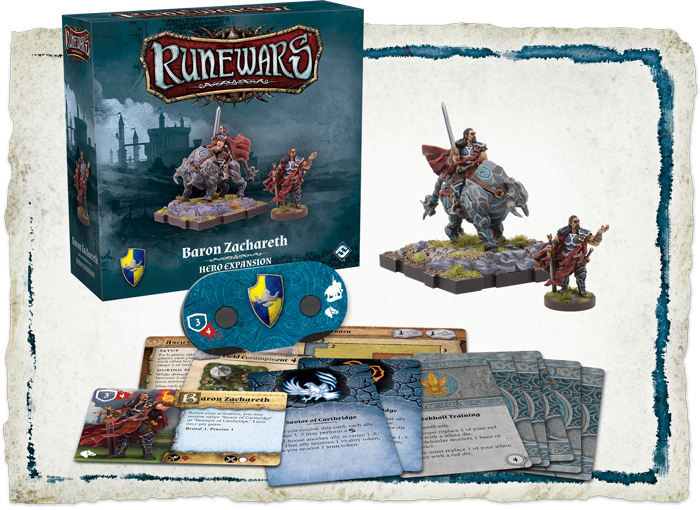 Baron Zachareth’s introduction to Runewars Miniatures Game also brings additional ranged support to the Daqan Lords with a green ranged attack action that falls towards the middle of the round. Unusually, as this attack relies on magic rather than a physical weapon, it does not slow Zachareth down—this attack may be paired with either a march, shift, or reform action to keep him mobile. Alternatively, you can increase the effectiveness of your attack with a white hit modifier. However you choose to use Zachareth’s skills, as a sniper or a bulwark, you are sure find his raw strength and ability to inspire his followers indispensable when you lead your army to war. 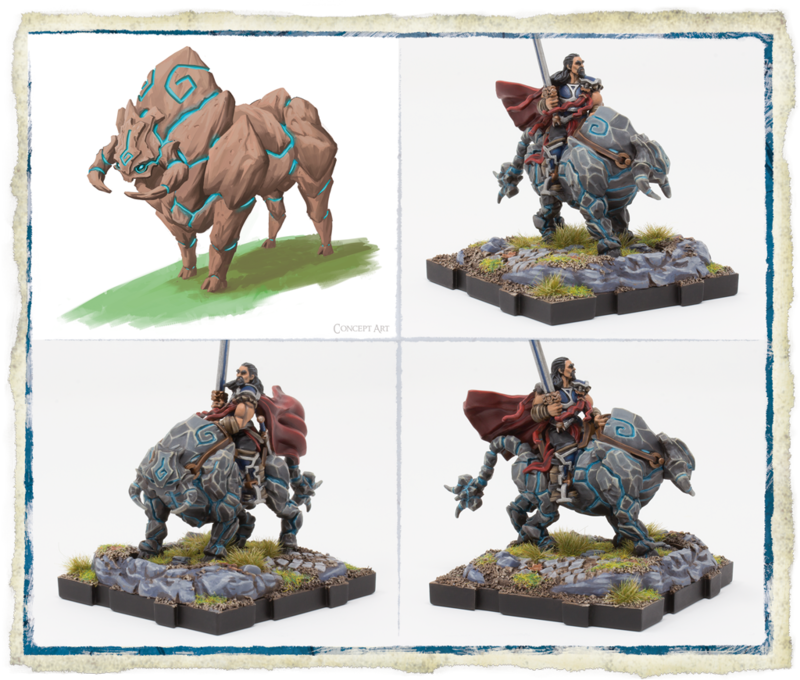 The Baron Zachareth Hero Expansion offers everything you need to add the hero of Cathridge to your Daqan army, including two unpainted figures—one of Zachareth alone and one paired with his noble rune-steed. If you can offer the baron a chance to achieve his ambition, he will gladly cast off the colors of Carthridge in favor of those of your Daqan army. As for the rune-steed, his coloring is determined by which type of magic you infuse him with. Legend has it that the energy used to bring these stone creatures to life also affects their temperament. Rune creatures infused with ice are stoic, while those awakened by lightning are naturally clever. But perhaps the most appropriate choice for Baron Zachareth’s companion would be the fire rune, which imbues the creature with a powerful will and aggressive nature. In addition to the lord and steed, you will find two condition cards and six upgrade cards to strengthen your noble army no matter how you choose to use the baron’s skills to your advantage. 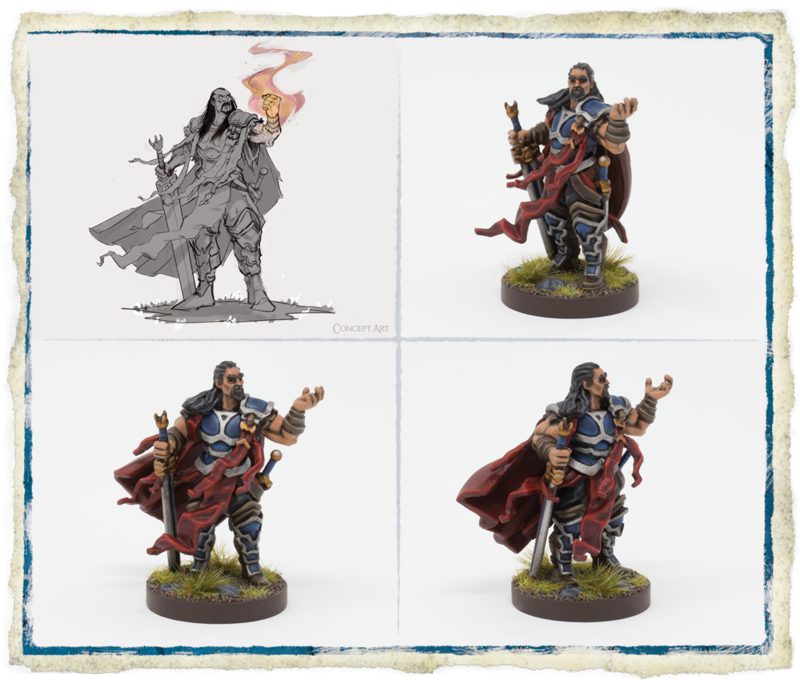 On the battlefield, Baron Zachareth uses his unmatched knowledge of ancient runes and arcane lore to empower his allies and destroy his foes. He can use his mastery over the element of fire, gained by years of Nerekhall Training, to increase the deadliness of his ranged attacks, replacing one of his red dice with a white die. However, by choosing this path, Zachareth must dedicate much of his focus to controlling his magic. Thus, when Zachareth is engaged in a melee, he must replace one of his white dice with a red die. 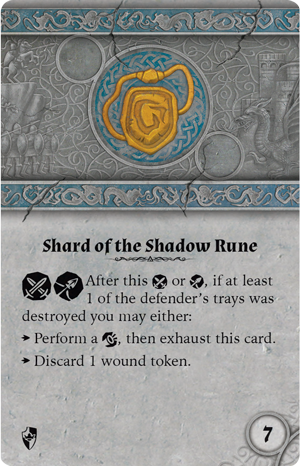 Whether he chooses to focus on melee or ranged attacks, Baron Zachareth can embrace his role as a morally ambiguous leader of the Daqan by using a Shard of the Shadow Rune. This artifact lends Zachareth’s vitality to any Daqan warrior who can wield it, allowing them to heal their wounds or rally if they destroy one of their enemy’s trays. While this does encourage the Daqan to embrace a certain brutality on the battlefield, when you are set against the locusts of the Ru or the undead legions of Waiqar himself, this is no time to be timid. Another lord of Terrinoth may be content to sit idle, but you cannot ignore the threat of the thirteenth barony any longer! Recruit Baron Zachareth to your cause and proudly lead the Daqan into the heart of the Mistlands! 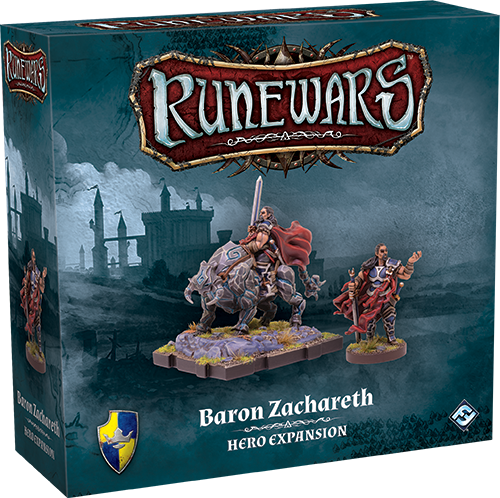 Pre-order your copy of the Baron Zachareth Hero Expansion (RWM32) at your local retailer today or on the Fantasy Flight Games website here!